The Tehachapi Symphony Orchestra (formerly Tehachapi Community Orchestra) is a non-profit symphony based in the mountain community of Tehachapi, California, David Newby, our music director, has conducted the award-winning orchestra since the 1999-2000 season. The Tehachapi Symphony Orchestra is fully supported by private donations and fundraisers held throughout the year. After thirteen years of performing in Tehachapi, the orchestra has improved so much to the point where it was going to by either the "Granddaddy of all Community Orchestras" or it needed a name change. Hence, the name "Tehachapi Symphony Orchestra" was chosen by the Board of Directors to reflect the achievements of the past decade. As we go forward, however, the orchestra's philosophy will not change. We will continue to be the people's orchestra, offering all of our concerts for free, so that everyone in the community will be able to enjoy our concerts. We will continue to ply 5-6 concerts per season, while sponsoring the Tehachapi Strings Orchestra, our intermediate-level teaching orchestra, conducted by our concertmaster. We will continue with our teaching mission of turning Tehachapi into a center of excellence for string playing. Presently, there are over 200 people studying strings in Tehachapi and we would like to add to that number. - Foster civic culture and educational interest in music by presenting concerts to the community. - Ensure that the entire community, regardless of income level, has access to classical music performances by providing concerts for free (with voluntary donations accepted at the door). - Provide a forum for community musicians to hone their skills and perform for the public. - Encourage and recognize the musical youth of the community and to present young artists to the public. The Tehachapi Community Orchestra was created in January of 1998, when a small group of musicians got together and set up a non-profit, tax-exempt foundation with a Board of Directors, whose sole mission was to start and maintain a community orchestra in Tehachapi, so that everyone in the community could have access to live classical music performances. The Orchestra began rehearsals with a dozen musicians, which quickly grew to 25 or more players. By May of 1998, the Board had auditioned four applicants for the position of Music Director and hired Raymond David Burkhart from Pasadena to fill the position. Musicians from as far away as Lancaster, California City, and even Bakersfield began coming to rehearsals. As a scholarship conductor at the Aspen School of Music, David Newby worked with Fiora Contino who appointed him Assistant Conductor of the Peoria Civic Opera. That year, he performed as a finalist in the Scarritt Conducting Competition. He served as Director of Vocal and Choral Music at Culver Military Academy, where his ensembles consistently won top honors. As Music Director of the Summer Opera Theatre at Indiana University, South Bend, his performances of La Bohme (Puccini) and Tales of Hoffmann (Offenbach) earned critical acclaim. His dissertation on Oedipus Rex (Stravinsky) received the 1996 Julius Herford Prize for Distinguished Research from the American Choral Directors Association and was hailed by The Choral Journal as "a major contribution to the study of Stravinskys music." He earned his Bachelor of Music degree from Illinois State University. At the Indiana University School of Music, he earned a masters degree in theory, and masters and doctoral degrees in conducting. He was profiled in Where Music Lives, a documentary on the Indiana University School of Music. David Newby has conducted the Tehachapi Community Orchestra since the 1999-2000 season. He is also Professor of Music at Antelope Valley College where he directs the orchestral and choral programs and oversees the Associate of Arts in Music degree program. Under his direction, the Antelope Valley Symphony Orchestra and Master Chorale merged in 1998, a union of two esteemed organizations, each with its own rich performance tradition. In addition to his position as Artistic Director for the AVSOMC, David Newby furthermore directs the Antelope Valley College Orchestra. In July of 1998 the Orchestra debuted with its first concert, Pops in the Park, with about 30 musicians. 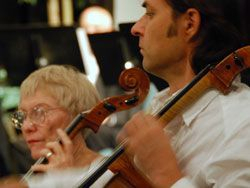 During this concert season, the Orchestra presented 5 concerts, each to a full house at either Tehachapi Church of the Nazarene or St. Malachy Catholic Church. Repertoire included Haydn’s Surprise Symphony, Mozart’s Concert for Horn and Orchestra featuring Principal Horn Ryan Ramey, and Mozart’s Clarinet Concerto, featuring Principal Clarinetist John Bolland. At Christmastime the Orchestra performed Handel’s The Messiah, in conjunction with a community chorus which the Orchestra had started. In addition, the Orchestra sponsored a Young Artist Competition and awarded a $200 scholarship and a chance to perform with the Orchestra to Flautist Maria Gomez. Further, the Orchestra commissioned a work by its Music Director, Mr. Burkhart, entitled Ceremoniale for Brass and Percussion and performed its World Premiere here in Tehachapi. During the summer of 1999, the Orchestra lost its Music Director, in part due to his long weekly commutes from Pasadena, but the Board was able to hire Dr. David Newby from the Antelope Valley as its new Music Director (see Music Director Biography section). Under his capable direction, the Orchestra has grown dramatically, both in quality and number of players. The 1999-2000 concert season opened with Pianist Kumaran Arulanantham playing Rhapsody in Blue by George Gershwin, attracting such an overflow crowd that the Orchestra had to begin looking for a new concert venue! In December, the Orchestra presented Handel’s The Messiah to an overflow crowd at St. Malachy Catholic Church. In February 2000, the Orchestra moved to a new home at Country Oaks Baptist Church, which had just opened a new 550 seat sanctuary. The first concert in the new venue featured Principal Bassist Ron Brzezinski in Concerto for Contrabass and Orchestra by Domenico Dragonetti. The Orchestra held its now annual Young Artist Competition and selected Tehachapi violinist/fiddler Molly Carlson as its winner. She performed all three movements of Violin Concerto in A minor by Antonio Vivaldi, entirely by memory(!!) at the Orchestra’s May concert. The Orchestra finished out the season with its annual Pops in the Park concert on July 4 and a “breakfast concert” at Benz-Visco Park to open the Wind Fair celebration. The 2000-2001 season opened with a Children’s Concert that featured Peter and the Wolf by Prokofiev, with narration by local actor Royce Cox, who was Jack Pallance’s under-study for this performance. Pallance was called away on an emergency at the last minute, and Cox delighted the crowd, which was about 25 per cent children, with an admirable performance, albeit on short notice! In the fall of 2000, members of the Orchestra played chamber music concerts at Tehachapi’s elementary schools and introduced the children to such diverse instruments as the bassoon, oboe, French horn, and viola. The Orchestra celebrated Christmas again with the now traditional rendition of Handel’s The Messiah. In February 2001 the Orchestra performed everybody’s favorite work, Beethoven’s Symphony No. 5 and featured internationally acclaimed Pianist Louise King in Mendelssohn’s Piano Concerto in G minor. The following weekend, the Orchestra took this same concert on the road and performed at California City in East Kern County, where arts funding (and therefore, art) is almost non-existent. The Orchestra received a standing ovation in California City and an invitation to return. In May the Orchestra presented its annual Young Artist winner, Pianist Grace Liu of Bakersfield, in Piano Concerto in A by Mozart. The Fourth of July concert was held at the Tehachapi Airport in a huge plane hangar, and was followed by a fireworks show. One of the attendees at this concert was Movie Producer Matt Clark, who was so impressed with the Orchestra that he asked them to perform in a movie he was helping direct. In an effort to involve more community residents in the classical music experience, many of the Orchestra’s players began teaching private lessons on their respective instruments. There is no orchestral music program in the public schools so the Orchestra started the Tehachapi Junior String Orchestra, conducted by Concertmaster Gayel Pitchford, to provide an ensemble experience for all its “budding” string players. Some 20+ musicians now participate in this group, which has performed for Orchestra fund raisers at Mourning Cloak Ranch, for the Bear Valley Cultural Arts Association, and in two public concerts per year ever since its founding. The 2001-2002 season opened with a three-day Haydn Festival, featuring Haydn’s Celebrated Piano Trios performed by the Nona Pyron Trio (Cellist Nona Pyron, Pianist Louise King, and Violinist Ann Lekven), a solo recital program by Pianist Louise King, and the Orchestra playing Haydn symphonies and performing Haydn’s Cello Concerto in C with Cellist Nona Pyron. In addition, the Orchestra collaborated with the visual artists of the community to stage an Art Show and provided a trio of musicians from the Orchestra to play Haydn’s London Trios during the Artist’s Reception. At Christmas, the Orchestra performed Handel’s The Messiah, and in February played an all-Brahms’ concert, including Brahms’ Symphony No. 2 and featuring Pianist Thomas Linde in Brahms’ Piano Concerto No. 1. This concert, and a second performance at Rosamond were played under the baton of Guest Conductor Ron Burdick. In May the Orchestra performed Dvorak’s Symphony from the New World and featured Young Artist winner Violinist Robert Kao in the Kabalevsky Concerto for Violin and Orchestra. The season ended with the traditional Fourth of July concert outdoors under the stars of Tehachapi. The Orchestra took three concerts on the road this season: to Taft, Rosamond, and Delano, none of whom have an orchestra in their town. These concerts were funded by the County Board of Supervisors. The Orchestra also took chamber musicians to the public schools for concerts again. In August 2001, the Orchestra played at the Hollywood Bowl for the filming of Carolina, a Miramax movie starring Shirley McLaine, Julia Stiles, Dennis Quaid, and Allessandro Nivolo. In its “big scene,” the Orchestra is on stage at the Bowl being rehearsed by its esteemed Music Director, Dr. David Newby, who conducts them in the fourth movement of Schubert’s Symphony No. 5. It would be two more years before the movie was actually released; it is now available on DVD. The season opened with the talented Cellist Rachael Lonergan soloing in the Saint-Saens’ Cello Concerto No. 1 in A minor. In December, the Orchestra performed Handel’s The Messiah, this time with local chorus and soloists. Internationally acclaimed Violinist Mischa Lefkowitz of the Los Angeles Philharmonic played Violin Concerto No. 7 in D by Mozart at the winter concert and also went with the Orchestra to Rosamond to perform there as well. The May concert featured Young Artist winner Oboist Christina Douglas of Ridgecrest in Haydn’s Concerto for Oboe and Orchestra. The annual Fourth of July concert was again held at Coy Burnett Stadium. Even larger than last year, the crowd enjoyed picnic dinners while listening to pops, patriotic songs, and show tunes under the stars. The program ended with a huge fireworks show sponsored by the City of Tehachapi. The Orchestra took two concerts on the road this season: to California City and Rosamond, providing classical music to communities that do not have an Orchestra of their own. Orchestra members also took chamber music concerts to the elementary schools, demonstrating various instruments and different types of music. The season began with Pianist Kumaran Arulanantham returning to play Beethoven’s Piano Concerto No. 5 to the delight of the audience who remembered him fondly from his Gershwin performance in 1998. The Orchestra played Mendelssohn’s Symphony No. 4. Following this concert the Orchestra received a serious blow when Country Oaks Baptist Church told them they could no longer play at that venue, as they needed their sanctuary for church activities. The Orchestra was forced to move to the Middle School Cafeteria, hardly a suitable venue for an Orchestra, but the only other large (400+ seats) venue in town. The Orchestra rebounded with a performance of Handel’s The Messiah, featuring the Antelope Valley Master Chorale, who also provided the soloists. The venue may have been sub-standard, but the performance was glorious. In February, by repeated requests from the audience, Violinist Mischa Lefkowitz of the Los Angeles Philharmonic returned to dazzle the audience with the pyrotechnics of Saint-Saens’ Introduction and Rondo Capriccio and the lovely lyrical qualities of Tchaikovsky’s Souvenir d’un lieu cher. The Orchestra rounded out the program with Tchaikovsky’s Symphony No. 6. Young Artist winner Pianist Joy Wong of Bakersfield headlined the May concert, playing a movement of Beethoven’s Concerto No. 2 for Piano and Orchestra. The Orchestra also performed Mozart’s Symphony No. 41. The season drew to an end with a giant Pops Music and Fireworks show under the stars at Coy Burnett Stadium. Part of the mission of the Tehachapi Community Orchestra is to educate the public about classical music, so the Orchestra decided to feature one of the more unusual—and lesser know instruments—of the Orchestra in a solo work. Bassoonist Andy Radford joined with the Orchestra to perform Mozart’s Concerto for Bassoon and Orchestra. Many of the young people attending this concert came up to Andy at intermission to look at his “odd instrument.” The Orchestra completed the program with Dvorak’s wonderfully-melodic Symphony No. 8. The Orchestra celebrated Christmas with a rendition of Handel’s The Messiah, and then in February featured the Concertmaster of the Antelope Valley Symphony, Violinist Armen Anassian, in Prokofiev’s Violin Concerto No. 2. Beethoven’s Symphony No. 6 rounded out the program. The May concert featured Young Artist winner Pianist Ashley Haymond of Bakersfield in Mozart’s Piano Concerto No. 27. Her performance actually morphed into the World Premiere of Mozart’s Concerto for Keyboard, as the company responsible for delivering a piano to the Middle School cafeteria failed to appear. Haymond borrowed a keyboard from the Orchestra’s keyboardist Jo Stone and played her piece without a hitch! She received a standing ovation from the audience and the deep gratitude of the Orchestra for her aplomb. The rest of the concert didn’t fail by comparison as the Orchestra played a stirring rendition of Mussorgsky’s Pictures at an Exhibition. The program, designed by Flautist Mickey Beutick, contained copies of the pictures themselves, and Dr. Newby provided the audience with a great explanation of this major work. Fourth of July found the Orchestra again under the stars playing pops music and watching the City’s annual fireworks extravaganza. The 2005-2006 season opened in September, as the Orchestra joined forces with District 3 of the California State Old Time Fiddlers Association at their 29th Fiddlin’ Down the Tracks old time fiddle contest. Classically-trained Bluegrass Fiddler Richard Greene, who had played with Bill Monroe and the Bluegrass Boys on the Grand Ole Opry for a number of years, came to Tehachapi to perform with the Orchestra the World Premiere of four works which Greene himself composed: a concertino entitled What if Mozart Played with Bill Monroe? and three smaller pieces entitled Chelsey’s Dream, Savannah Moon, and Done Gone Waltz. This concert was held on the last day of the Fiddle Contest at West Park Activity Center. The walls were covered with beautiful quilts made by the Tehachapi Mountain Quilters and 850+ people (an SRO crowd) attended the concert, the Orchestra’s biggest indoor crowd to date. The Orchestra rounded out the all-American concert program with Aaron Copland’s fiddlistic piece Hoedown from Rodeo and George Chadwick’s Symphonic Sketches. At Christmas the Orchestra brought the Antelope Valley Children’s Chorus to Tehachapi to perform with them Kapilow’s Van Allsburg’s Polar Express and Zegree’s A Charlie Brown Christmas. The Orchestra closed the program with Leroy Anderson’s Christmas Festival. February’s concert, which was repeated in California City in March, featured Violinist Mischa Lefkowitz again, this time in three dazzling pieces: Weniawski’s Scherzo Tarantelle and Legende, and Sarasate’s Zigeunerweisen. The concert also included Mozart’s Symphony No. 35. This was definitely a “violin year” as the Young Artist winner this year was Violinist Cecelia Lay from Bakersfield, who performed Lalo’s Symphonie Espagnole. The Orchestra played Rimsky-Korsakov’s lovely Scheherazade, with towering solos by Concertmaster Gayel Pitchford, and Wagner’s Siegfried Idyll. The season closed with Pops music and fireworks at Coy Burnett Stadium, played to an enormous crowd of about 2,000 people. This was the “season of miracles,” as the Orchestra was once again housed back at Country Oaks Baptist Church. Furthermore, the Orchestra had been frustrated each Christmas at the effort to round up enough singers to perform Handel’s The Messiah. This year the Orchestra’s Keyboardist, Jo Stone, who performs in many venues around town, decided to take matters into her own hands. She rounded up about twenty outstanding singers and persuaded local music director Kathy Kelly to form a choir and conduct them on an ongoing basis. Thus was born the Tehachapi Symphonic Chorus. This season opened in November with Pianist Shun-Lin (Sam) Chou, playing Mozart’s Piano Concerto No. 23 with the Orchestra. (Shun-Lin is on the faculty at California State University—Long Beach.) The Orchestra also performed Schumann’s Symphony No. 4. In December the Orchestra and its new Tehachapi Symphonic Chorus, under the direction of Kathy Kelly, combined to perform Handel’s The Messiah, the first of many joint performances that would be undertaken. The Chorus also supplied the soloists, and this performance received a standing ovation from the audience, who were thrilled with the quality of the chorus. This concert was performed at 10:00 p.m. at St. Malachy’s Catholic Church, complete with candle lighters and candles. The Hallelujah Chorus, which completed the concert, was sung by everyone at midnight. The winter concert featured the emotionally-charged playing of Cellist Diego Miralles in Edward Elgar’s Concerto for Cello and Orchestra. Diego quickly became a favorite of the Tehachapi crowd. The Orchestra rounded out the concert with Beethoven’s Symphony No. 2. The July 4 concert was somewhat unusual this season, in that the Tehachapi Symphonic Chorus joined the Orchestra in songs from light opera and show tunes, in addition to the usual pops pieces, marches, and patriotic songs—and of course, those sparkling fireworks at the show’s end. The season marked the 200th anniversary of the death of Franz Joseph Haydn, so the Orchestra opened the season with a two-day Haydn Festival on November 10 and 11. Saturday’s concert marked the debut of the Mojave Piano Trio (later renamed the Hermes Trio), who delighted the audience with three of Haydn’s Celebrated Piano Trios, which the group (Cellist Diego Miralles, Violinist Maxim Eshkenazy, and Pianist Ryan McEvoy McCullough) has subsequently recorded. On Sunday the Orchestra and Tehachapi Symphonic Chorus performed selections from Haydn’s Teresien Mass. Cellist Diego Miralles again delighted the audience with his rendition of Haydn’s Cello Concerto in C, and the Orchestra closed the concert with Haydn’s Symphony No. 99. In December the Tehachapi Symphonic Chorus again joined the Orchestra for Handel’s The Messiah, infusing the audience with the Christmas spirit. February’s concert outdid the Orchestra’s wildest expectations, when 800+ people showed up for some 600 seats at Country Oaks Baptist Church to hear Guitarist Christopher Parkening perform with the Orchestra. Regrettably about 200 people were sent home, as the church was full to overflowing. (How this community needs a performing arts center!!) Parkening played Elmer Bernstein’s Concerto for Guitar and Orchestra, a work Bernstein had written specifically for Parkening, and then dazzled the audience with several solo guitar pieces. The Orchestra concluded this performance with Edward McDowell’s Suite No. 1. In May this year’s Young Artist winner, Violinist Bryn Rosander of Tehachapi, performed the first movement of Mozart’s Violin Concerto No. 3 in G with the Orchestra twice, receiving standing ovations from the crowds both in California City and Tehachapi. The Orchestra played Beethoven’s Symphony No. 4. The season closed with pops music and fireworks under the stars at Coy Burnett Stadium. The show sparkled with show tunes and light opera numbers performed by the Tehachapi Symphonic Chorus, clad in their new chorus logo shirts. The 2008-2009 season-opener in November featured Pianist Mark Richman in Gershwin’s Rhapsody in Blue for piano and orchestra. Rounding out the show was Schumann’s Symphony No. 3. Christmas saw another Old World performance of Handel’s The Messiah at St. Malachy’s Catholic Church, with the Tehachapi Symphonic Chorus performing brilliantly on the choruses and solos. The Chorus has grown to 40+ voices and this was definitely their best performance ever. Following the show, the Orchestra provided a quartet of its members, “Four with a Score,” to play Christmas music for a reception, so the audience could mingle with Orchestra and Chorus members. (The Orchestra normally has a reception after each concert, but this was the first one with live music).